The 40-6001 Distance Measuring Tool is loaded with useful features for easy measuring and some of these features are explained in the following review. The review explains that the 40-6001 contains the patented sound activation feature, which allows for easy measuring when the measurement is especially awkward to take with just a clap of your hands. The 40-6001 can be used with a tripod for more precise measurements and is compact enough to fit in a tool belt or your pocket. The tool is dust and water resistant and comes with a rubberized cover for added protection. This review was done by Chris Rodenius at Tool Rank and can be viewed in its original form at Tool-Rank.com. 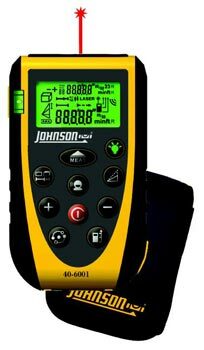 The new Model 40-6001 Laser Distance Measure is a first for Johnson, but it looks like they got plenty right. It doesn't get crazy with 800 feet of measuring, but it has plenty to offer at 165 feet with an accuracy of ±1/16" (±2mm). The 40-6001 has all of the features you would expect from a good LDM; including, indirect measurement capabilities for length and height; and single distance, area and volume measurements. The LDM also has a few features not seen in lasers in the same price range, like a backlit LCD screen and a 10 measurement memory. The coolest feature of all has to be the sound activated measuring mode. This new sound mode should come in handy during those moments of awkward one handed measuring. The 40-6001 also has a couple downsides. It has three measurement reference points (Front, Rear, and Tripod), but it lacks the forth measuring point for measuring in corners. Also a possible downside is the use a more expensive, less common, 9-volt battery. The 40-6001 includes a soft-sided pouch, safety strap, rubberized LDM protection cover, 9V battery, and instruction manual.